An episode guide to shorter expenditures into the Detective Conan story while watching the parts important to you. I have compiled a list of canon episodes that are actually significant as well as listed the reasons someone may believe them to be essential (so you can make your own judgments as you go as to whether you really think you should have to watch them or not). This is for the sake of those who might want to get into or try to convince a friend to get into Detective Conan for the story but find the insanely high episode count and 2-decade long history daunting. As hinted there, this is not a list of “must watch” episodes, but rather a list of episodes you may not want to miss depending on what aspects of the series you are trying to follow. The episodes labeled *Main Plot* are closer to that, but still not quite the same thing, because at least the occasional dose of character development here and there is “must watch” in its own way. There are tons of great “normal” cases that are self-contained throughout the series that naturally are left out, which are really the original point of the series, but if you just want to get around all of that and watch the series for just the overall story and characters, this might prove useful for that. Of course, there are still a ton of episodes, but cutting a good two-thirds of the series out should ease the pain of entry a bit. Note this uses the original Japanese episode numbers. The Funimation English dub version (aka “Case Closed” although the more recent official subs have adopted that name as well) stopped before it ever got to anything really huge in the story anyway, so watching that would kinda defeat the purpose. Update: I went ahead and added the alternative episode numbers as well where applicable in brackets (as [INTL #]). It turns out nowadays many international licensors have adopted the same method of numbering the series that Funimation used to. That might be useful to visitors from affected regions. Plus if someone really just wants to watch the English dub that bad, this will help them, too. I still would recommend against using this list with the English dubbed version, especially considering that version was canceled ages ago. Further update: And now more recently Funimation has let the license for those early dub episodes lapse, so you can’t really watch them anywhere anyway. The corresponding manga chapters are listed in parentheses next to the episode numbers if you are interested. The first set is the overall chapter numbers and the second is the chapters as contained within each volume, separated by a bar (|). If a manga chapter reference is followed by an asterisk (*), then there has been some story-critical change between the manga and the anime adaptation. The movies are entirely optional, seeing as they are generally not canon and have nothing to do with any sort of plot from the series proper (update: this is becoming less true recently), but still recommended based solely on outstanding quality (most of the time). Note their placement in the list is based on minimizing spoilers for the main series. Thus they are based primarily on their release dates relative to where the original manga was at the time. This consideration is because the movies tend to have spoiler references to things from the anime that came before the release of each particular film, and sometimes after, since the movies are often clearly being targetted at fans of the original manga more than anime-only fans. So watching a movie too early can be dangerous if you don’t like spoilers. Since the series started, and especially in the last few years, Aoyama has gotten infinitely better at weaving the story into the individual, unrelated manga cases. These days just about every canon case contains at least a bit of plot advancement, so plot advancement has become a lot more gradual and stretched out rather than happening in chunks scattered here and there. As a result, the more recent episodes pretty much all have some level of importance, except for anime original filler episodes, of course. Although, and I’ve stated as much before in the comments, as this list is about easing the barrier of entry, it is more the early episodes that really matter for trimming the fat. As you get closer and closer to completely caught up, it doesn’t really matter all that much anymore anyway. In short, this list starts to lose meaning the further you get in the series and the closer to caught up to the present you are. 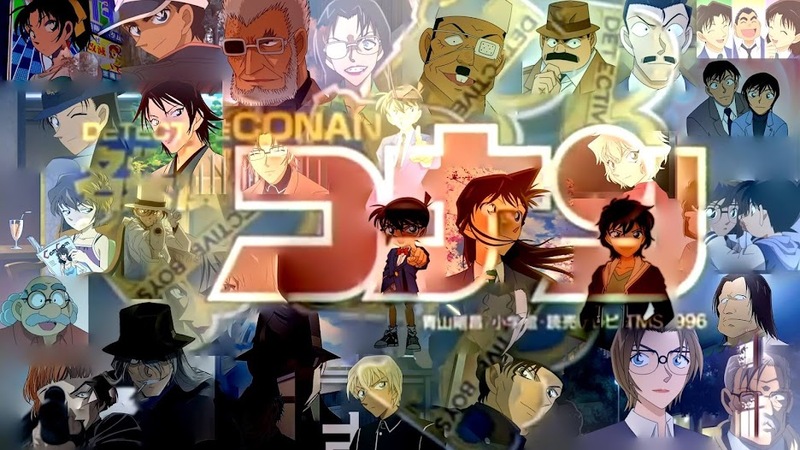 Since Detective Conan has had some direct crossovers with the Magic Kaito manga over the years, yet those parts of the Detective Conan anime never had the Magic Kaito parts that gave them context animated as well, those crossovers have never really had their full and proper effect for anime-only fans. However, now that Magic Kaito has finally received an adequate anime adaptation, I have taken the liberty of working the timings of these all-important crossovers into where they fit in with their Detective Conan episode counterparts, making the crossovers whole once more. The Internet can thank me later. The only issue is that the Magic Kaito episodes are entirely out of order. But, the order really does not matter for that series as it does with Conan, as the series is entirely episodic beyond pretty much the first episode. So, you can ignore that and watch that series in any order you wish. 3 (manga 6-9|V1F6-9): Character development and some elements introduced for the first time. 4 (manga 36-39|V4F7-10): Mitsuhiko, Ayumi, and Genta’s first focus episode. 5 (manga 33-35|V4F4-6*): More minor character development with shades of preparation for episode 7, and the manga version includes and reveals some important info about Gin and Vodka, like their names being Gin and Vodka, but the anime changed this by replacing them with one-off characters for some reason. 10 (manga 68-71|V7F8-V8F1): Introduces some minor recurring elements that will be referred to countless times in the future. 12 [INTL 13](manga 81-83|V9F1-3): Introduces the turbo skateboard and detective badge, as well as makes the Detective Boys into... the Detective Boys. 18 [INTL 19](manga 78-80|V8F8-10): Introduces Superintendent Matsumoto. 20 [INTL 21](manga 17-19|V2F8-10): Introduces the Elasticity Suspenders, and the manga version was the first introduction of the Detective Boys. 27-28 [INTL 28-29](manga 84-86|V9F4-6): Mouri Kogoro character development. 32 [INTL 33](manga 105-107|V11F5-7): Introduces Kisaki Eri, Ran’s mom. 34-35 [INTL 35-36](manga 40-44|V5F1-5): Suzuki Sonoko development (was her first appearance in the manga). Magic Kaito 1412 eps. 1-2: Introduces Kaitou Kid and Nakamori Ginzo. 77-78 [INTL 80-81](manga 150-153|V15F10-V16F3): Heiji case. Some Conan development. 81-82 [INTL 84-85](manga 144-146|V15F4-6): Voice actor references galore. 100-101 [INTL 106-107](manga 173-175|V18F3-5): Shinichi case. Main character development. 130-131 [INTL 140-141] (manga 189-191|V19F9-V20F1): Introduces Sato Miwako. 132-134 [INTL 142-144] (manga 192-196|V20F2-6): Kaitou Kid. 136-137 [INTL 146-147] (manga 200-203|V20F10-V21F3): Character development. 141-142 [INTL 151-152] (manga 211-214|V21F11-V22F3): Heiji case. 153-154 [INTL 163-164] (manga 219-221|V22F8-10): Introduces Kyogoku Makoto. 166-168 [INTL 177-179] (manga 246-250|V25F4-8): Heiji case. 199-200 [INTL 214-215] (manga 264-266|V27F1-3): Character development. 212-213 [INTL 228-229] (manga 273-275|V27F10-V28F2): Haibara development. 217-218 [INTL 233-234] (manga 284-286|V28F11-V29F2): Megure development. Magic Kaito 1412 eps. 4-6: Introduces Hakuba Saguru and the origin of the long-standing rivalry between Conan and Kid. 220-221 [INTL 239-240] (manga 276-278|V28F3-5): Introduces Heiji’s mom. 222-224 [INTL 241-243] (manga 279-283|V28F6-10): Heiji case. Some Conan development. 238-239 [INTL 257-258] (manga 293-295|V29F9-11): Heiji case. Conan development. 240-241 [INTL 259-260] (manga 296-298|V30F1-3): Character development. 242 [INTL 261] (manga 303-304|V30F8-9): Some Haibara development and very minor Black Organization info. 246-247 [INTL 265-266] (manga 311-313|V31F5-7): Haibara development. 291-293 [INTL 313-315] (manga 361-365|V35F11-V36F4): Heiji Case. 323-327 [INTL 348-352] (manga 390-397|V38F8-V39F5): Heiji case. 329-330 [INTL 354-355] (manga 398-400|V39F6-8): Haibara development. 333-334 [INTL 358-359] (manga 413-416|V40F10-V41F3): Character development. 346-347 [INTL 376-377] (manga 435-437|V42F11-V43F2): Some Haibara followup development. Magic Kaito 1412 ep. 16: Crossover with DC 356. They both spoil each other heavily, so maybe watch whichever is more important to you first. But, if you only want to watch one over the other, pick DC. 394-396 [INTL 428-430] (manga 475-478|V46F7-10): Kaitou Kid. 398-399 [INTL 432-433] (manga 479-482|V46F11-V47F3): Some set up and building suspense. 406-408 [INTL 440-442] (manga 487-490|V47F8-11): Heiji case. 421-422 [INTL 455-456] (manga 410-412|V40F7-9): Agasa development. 457-458 [INTL 497-498] (manga 541-543|V52F9-11): Sonoko and Makoto development. 469-470 [INTL 509-510] (manga 544-547|V53F1-4): Kaitou Kid. 472-473 [INTL 512-513] (manga 570-573|V55F6-9): Kaitou Kid + Shinichi case. Magic Kaito 1412 ep. 21: Crossover with DC 515. Lots of repitition between the two, so watch whichever you like more first. 532-535 [INTL 583-586] (manga 667-673|V64F4-10): Development for Superintendent Matsumoto, Takagi, and Sato. 537-538 [INTL 588-589] (manga 674-676|V64F11-V65F2): Kaitou Kid. 557-561 [INTL 608-612] (manga 680-686|V65F6-V66F1): Some character stuff for some of the main characters, introduces Morofushi Takaaki, and some Inspector Yamato and Uehara development. 568-569 [INTL 619-620] (manga 687-689|V66F2-4): Inspector Shiratori and Kobayashi-sensei development. 573-574 [INTL 624-625] (manga 693-695|V66F8-10): Heiji case. 583-585 [INTL 634-636] (manga 705-708|V67F9-V68F1): Inspector Shiratori and Kobayashi-sensei development. 592-593 [INTL 643-644] (manga 716-718|V68F9-11): Ran development. 610-613 [INTL 661-664] (manga 734-740|V70F5-11): Heiji case. 624 [INTL 675] (manga 741-742|V71F1-2): Introduces Miike Naeko. Magic Kaito 1412 eps. 9-11: Lead-in to DC 627-628 followed by those episodes from Kid’s perspective. Regardless of how some of the other crossovers may be, this one is entirely meant for Magic Kaito to come before DC. The manga chapters these were based on were actually released as a lead-in to the Detective Conan chapters the DC episodes were based on, and it makes a lot less sense without that lead-in. 627-628 [INTL 678-679] (manga DC731-733|V70F2-4 [prologue MK29-30|V5C1-2]): Kaitou Kid. Magic Kaito 1412 eps. 3, 7, 8, 12-15, 17-20, 22-24 can be watched whenever you want. 652-655 [INTL 704-707] (manga 781-786|V74F8-V75F2): Heiji case. Introduces Yonehara Sakurako. 659-660 [INTL 711-712] (manga 790-792|V75F6-8): Detective Chiba and Miike development. 710-715 [INTL 762-767] (manga 831-840|V79F3-V80F1): Heiji case. 724-725 [INTL 776-777] (manga 828-830|V78F11-V29F2): Kaitou Kid. 740-741 [INTL 793-794] (manga 856-858|V81F6-8): Minor Sera development. Also starts with a recap of the only tiny part of 738-739 that has any relevance to the plot, so watching this case makes that one easily skippable. 763-764 [INTL 816-817] (manga 879-881|V83F7-9): Heiji case. 772-773 [INTL 825-826] (manga 882-884|V83F10-V84F2): Shinichi case. 808-809 [INTL 863-864] (manga 909-912|V86F5-8): Heiji case. 814-815 [INTL 869-870] (manga 918-920|V87F3-5): Kuroda development. 822-823 [INTL 877-878] (manga 925-927|V87F10-V88F1): Some Kuroda followup. 830-832 [INTL 885-887] (manga 931-935|V88F5-9): Heiji case. 843-844 [INTL 898-899] (manga 939-941|V89F2-4): Tiny hints related to Sera’s outside sister. 847-848 [INTL 902-903] (manga 942-944|V89F5-7): Detective Chiba and Miike development. There is also a lot of random recap for little details from the main plot, in case you need a refresher. 853-854 [INTL 908-909] (manga 921-924|V87F6-9): Shinichi case. 872-874 [INTL 927-929] (manga 958-962|V90F10-V91F3): Heiji case. Introduces Ooka Momiji. Also a very brief follow-up for Ran from episodes 866-867 that doesn’t give any new information nor turn into anything and is ultimately just a handwave, if you’re into that and really can’t wait to see it. 885-886 [INTL 940-941] (manga 981-983|V92F11-V93F2): Heiji and Amuro case. Introduces Iori Muga. And some Momiji development. 887-888 [INTL 942-943] (manga 963-965|V91F4-6): Kaitou Kid. 916-917 [INTL 971-972] (manga 990-993|V93F9-V94F1): Heiji case. Note unlike past movies which are entirely optional in every way, this one is reasonably necessary if you’re following the Heiji/Kazuha plotline, but otherwise still unnecessary if you’re not. That said, there are some minor aspects of the Scarlet School Trip case that will not make sense if you skipped this one. 919-920,925-926 [INTL 974-975,980-981] (manga 994-999|V94F2-7): Setup. Slight Amuro development.